Jan. 23 Fri. It snowed real hard this morning when I went to school. I came over to my seat the first thing and stayed until the little bell rang. Went to Lyceum and Will went with me. Joe told me that I never looked so well before. carrie N. was there and we had some time to talk but not much for C. bothered us so. I was chairman. John Ninda went home with me. Did not go to school in the afternoon. Had intended to if Carrie N. had not have come in. Jan. 24 Sat. Went up to the Library and met Joe H. and Carrie N. We stayed and talked quite a while and then we went over to the Post Office. All the boys were there. I have heard something that makes me provoked. Carrie came down in the evening and stayed a little while. I love her better than anyone I believe. J. H. came to the door and I think had intended to come in. Jan. 25 Sun. I did not go to Church or S. S. in the morning but stayed home to read, sang and played and cracked nuts with Ben. The book that I have is splendid, almost as good as Ruth. It is Richard Vandermarch. Went to church in the evening. ALl of the boys and girls were there. Will came home with me. Jan. 26 Mon. Went to school. Had all my lessons. Strickland told me that he came down to my house Saturday night and saw a light in the parlor and someone sitting there so "I would not come in." He was intending to spend the evening. Went up to Carrie N. after school and we saw Anna Rice. Have her album to write in. It is real pleasant today. Jan. 27 Tue. Went to school. Had ever so much fun. J. Stoddart came to my seat this noon. Have not spoken to S. Had a meeting of the lyceum after school. When I got home I found Carrie N. She stayed until dark. Had to write a composition tonight and do ever so many other things. Have a compliment for Carrie from W.
Jan. 28 Wed. Strickland came over and sat with me this noon, but I was not very pleasant and answered him rather sharp. He is going to the social at Littlefields with Joe, I with Wilie and Cad and G. W. We had a real nice time. I got acquainted with quite a good many. S. talked with me a long while and Joe looked horrid. Even Will noticed and spoke about it. She said she was going to dress and look just as nice as she could. Jan. 29 Thurs. Had ever so much fun in school, laughed out loud two or three times. Joe and I made everyone in the room look at us, we acted so. Of course we had to stay after school half an hour, but we went in the Library and laughed and talked all the time. Went up to Cad N's after school with Jen S. Did not go to the Playdees but Will went. Durbin and I had a debate. Jan. 30 Fri. Well, it has stormed very hard all day long. I came home in it all this noon and went back to school. Cad M. came down and went to Lyceum with Will. I had a good time at the social (it had stopped snowing), I promenaded with Strickland and sat with C. W. during L. We did not hear two words of the debate but were watching for answers to certain notes that we sent. I gave John N. the mitten. The critique of last week said that I very modestly and becomingly did my duties as chairman. 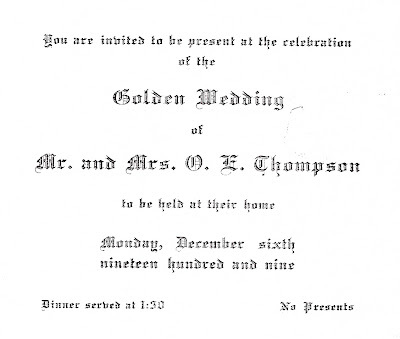 O. E. Thompson and his wife Elizabeth celebrated their 50th wedding anniversary in the tail end of 1909 with a lunch party at their home at 113 Cross Street. This appears to be the NE corner of Cross and River at the Thompson building; did they live upstairs? 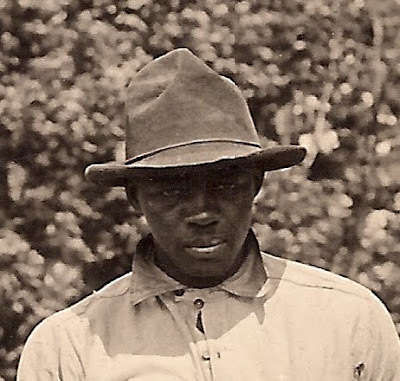 O. E. was 71 years old when, three and 1/2 months later, he died on March 29, 1910 of a gangrenous right leg. Dusty D was interested to note "No Presents" in the invitation; thought that was a modern custom. O. E. had an expressive face. In it I see the faraway gaze of a dreamer-inventor, a curious intelligence and orderly mind, and a calm and confident and ethical nature. He was esteemed in town, as you can see by the size of his obituary (and its headline, unusually large compared to other obits) and the affection within it. Reader Query: Why was EMU's McKenny Hall Named for President Charles McKenny while Still Alive? Kind reader cmadler quite sensibly asked, per the Normal Girls story below, why McKenny Hall was named for then-president Charles McKenny. 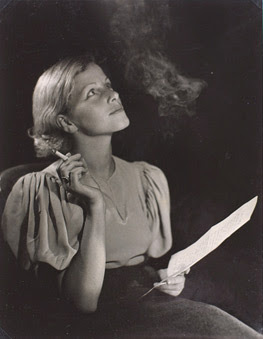 She pointed out that it is unusual to name a building after oneself during one's lifetime. "Hmm, it sure is," DD thought. So I looked in my 1931 file to find out when it had been dedicated. I hoped to find a clue in the many stories that filled the paper on the day of its dedication. 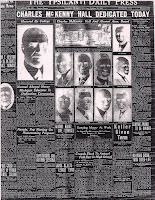 Here's the front page for October 24, 1931, the big dedication day (combined with Homecoming). This edition of the paper is also filled with about a dozen congratulatory ads from local businesses--this was really a big deal. What seems to be the key story, however, is the one at left, in two sections. The first para contains what seems to be the answer. (You can click to enlarge). ". 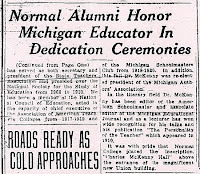 . . Dr. Charles McKenny, president of Michigan State Normal College is honored today by one of the finest tokens of appreciation a college could bestow upon its president, the naming of the beautiful Charles McKenny Hall in his honor." The answer appears to be, on the face of it, that the college and perhaps the Alumni Association were the bodies responsible for naming the hall. This isn't definitive proof of course. I'll be looking to see if I can nail this down more firmly sometime over the next week as time permits. I s'pose for now we can tentatively say that it appears it was named for Charles simply to honor him. Thanks to cmadler for this observant question! EMU students: Have you reported the name of your date to a faculty member? Don't forget to also inform your professor where you two will be going, what you'll be doing, and, oh, the "ten o'clock" rule is in effect and we'll be checking to make sure you're back at your boarding house by ten--no later! Those are the strictures EMU women used to have to put up with. Read all about it, and how they responded, in my latest story in the Courier! Last week's photo was correctly guessed by BF, designated conservative, cmadler, Elizabeth, and Anonymous. 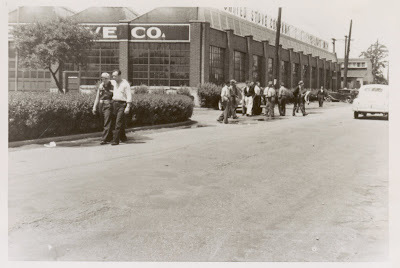 1926-c. 1942-5: United Stove Co.
1986?-2002: Storage facility for building's owner's collection of fire trucks, later moved to our 2002-opened firehouse museum. Ohhhhh-kay. Now, I'm taking the gloves off. I'm gonna go for broke and post a photo I've been holding back on my desktop because I thought it was utterly too obscure. And it is--a generic building portrayed in a damaged glass-plate photo. So. The gloves are off. (My hands are cold, darnit). Take your best guess! Click to read more about: fire truck , michigan crown fender , standard oil , suds factory , united stove co. Dusty D is examining O. E. Thompson's death certificate. O. E. Thompson, the onetime owner of what was the sole remaining Civil War barracks in Michigan, died of gangrene of the right leg. More information from the death certificate: He was 71 years, 6 months, and 18 days old. Male, White, died March 28 1910. Born September 10, 1838. Occupation: Manufacturer of farm machinery. 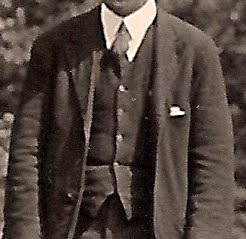 Father Benjamin Thompson of Maine; mother Marcy S. Emmerson (?) also of Maine. His oldest son Benjamin was the witness to the death certificate, and his signature appears there. Buried in Highland Cemetery on March 30. Undertaker was William J. Clark. His obit appears in the March 29, 1910 Ypsilanti Daily Press. "The death of Oliver E. Thompson occurred Monday evening at quarter after eight at his late residence on East Cross Street. Mr. Thompson had been ill but for a brief time. About a week ago an attack of gangrene made the amputation of his right leg necessary. He rallied from the shock of the operation very well, but a few days ago he began to sink rapidly, and his condition seemed hopeless. 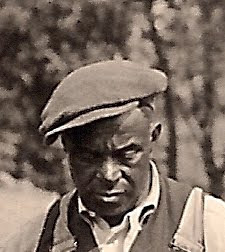 "Mr. Thompson was born in this city and always resided in the 4th Ward. 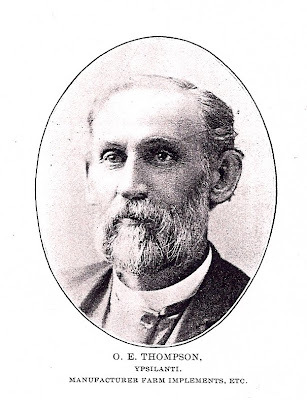 He was a member of the First Methodist Church [illegible] and also on the board of education. 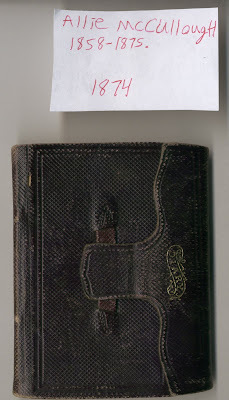 When younger, Mr. Thompson was a member of the volunteer fire department [illegible] company No. 1, which won the interstate trophy. 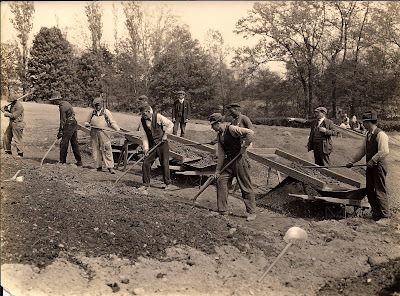 He was a member of the First Ward water board, and it is considered that the good water system in this city is largely attributable to Mr. Thompson's efforts. Since early manhood Mr. Thompson has been engaged in the manufacturing business. He invented the wheelbarrow grass feeder bearing his name, which is used very extensively. 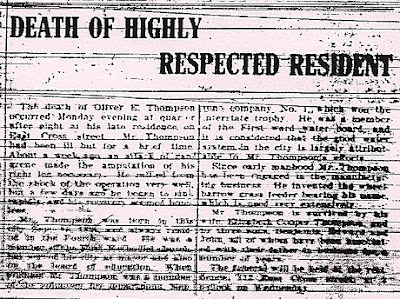 "Mr. Thompson is survived by his wife, Eliabeth Cooper Thompson, and by three sons, Benjamin, Edward, and John, all of whom have [been working?} [illegible] a number of years. "The funeral will be held at the residence, 113 East Cross Street at 2 o'clock on Wednesday." 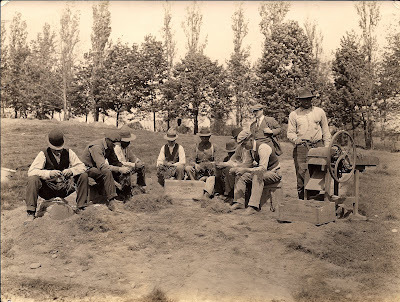 Ypsilantians opening their Ypsilanti Daily Press a century ago read of the passage of the Mann Act, which forbade the transport of James Mann across state lines--he was too valuable to Ypsilanti. No, not really. 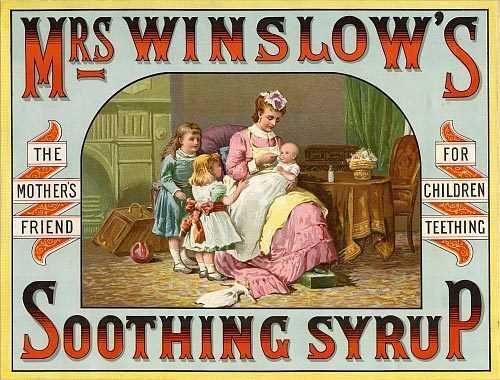 The measure was introduced by Congressman James Robert Mann, who also introduced legistation that became the Pure Food and Drugs Act, passed four years earlier in 1906. Persons convicted under the Mann Act include Charlie Chaplin, whose relationship with actress Joan Barry went into court--in 1944. He was 55 and she was 24 at the time--both consenting adults. The Mann Act made strange bedfellows. Two other persons charged with violations of the Mann Act were Frank Lloyd Wright (charges were dropped) and Charles Manson (charges also dropped). Here's some interesting backstory on the cultural context in which the Mann Act was passed, from here. "The Mann Act was born during the "white slavery" hysteria of the early 20th century. Along with other moral purity movements of the period, the white slavery craze had its roots in fears over the rapid changes that the Industrial Revolution had brought to American society: urbanization, immigration, the changing role of women, and evolving social mores. 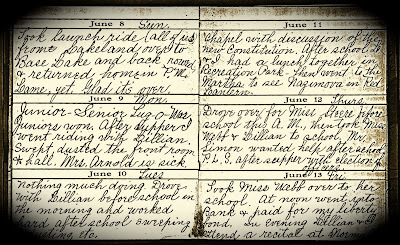 As young, single women moved to the city and entered the workforce they were no longer protected by the traditional family-centered system of courtship, and were subjected to what Jane Addams called the "grosser temptations which now beset the young people who are living in its tenement houses and working in its factories." "As Progressive Era social reformers (many of whom did not distinguish between sexually active women and prostitutes) began to call attention to what they saw as a widespread decline in morality, foreigners emerged as an easy target. Unfettered immigration provided an endless supply of both foreign prostitutes and foreign men who lured American girls into immorality. Muckraking journalists fueled the hysteria with sensationalized stories of innocent girls kidnapped off the streets by foreigners, drugged, smuggled across the country, and forced to work in brothels. Borrowing a term from the 19th-century labor movement, muckraker George Kibbe Turner called prostitution "white slavery," and in a 1907 article in McClure's Magazine claimed that a "loosely organized association... largely composed of Russian Jews" was the primary source of supply for Chicago brothels. Pulp fiction and movies (then a novelty) fanned the flames even more." One longtime tenant of the Thomson building was, duh, O. E. Thompson, natch. 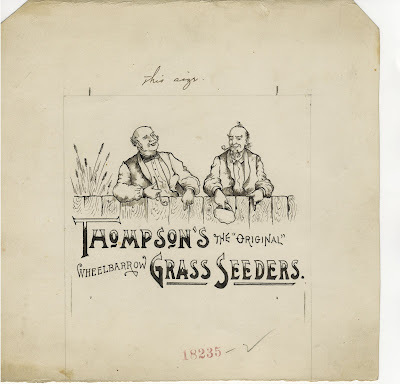 Dusty D was digging around in the "miscellaneous business" file the other day and found this gem--a hand-drawn ad, pencil marks still visible, for Thompson's Grass Seeders. This was a piece of artist's drawing-board or craft-board that would be taken down to the local paper; note the note to the printer: "this size." The drawing area is about 4.5 inches square. 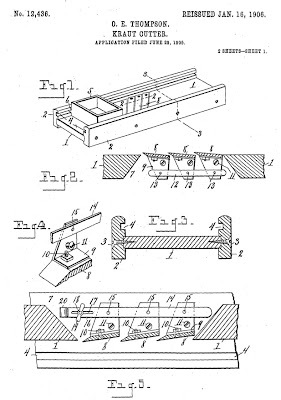 The seeder may have been a device of Thompson's own invention. 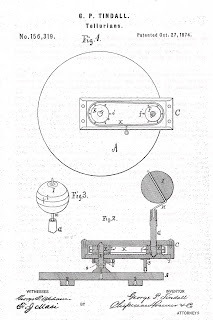 Thompson was a prolific inventor and produced several of his inventions right there in the Thompson Building. 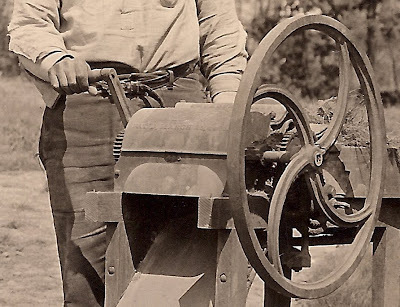 Some of his inventions include a root-cutter, a kraut cutter (very much like a modern kitchen mandoline, at right), and two different fertilizer distributors. Not to be snarky, Dusty D loves how the advertisement's word "original" is put in "quotes." Those who love to decry what they perceive as illiteracy in supermarket "signs" and the like can see that such "mistakes" have an old "precedent." Jan. 21 Tues. Seniors kidnapped Juniors drove out into the country + allowed the Juniors to walk back. Druse Osborn, Jim Orr, + Paul Cairns "canned" by Mr. A.
Jan. 22 Wed. "Canned" boys returned. Went to the Sunday School supper (Prof. Laird's class) with Miss Densmore, 6 o'clock. Basket ball game after school. Jan. 23 Thurs. P. L. S. postponed on account of Basket ball game with Normal High. Pay day to morrow. Jan. 24 Fri. Sophomore-Freshman debate. Sophomores won. Miss Gieske very nervous. Miss Laird over. Returned Mrs. Bacher's papers. Jan. 25 Sat. Went into Detroit with Miss Laird on the 7:30 car. Attended the Madison Thetre saw Pres. Wilson + party on the way in Europe--did a little shopping, etc. Arrived home at 5. Jan. 26 Sun. Home all day except to walk down to garage to get license blank. Finished Rob's second pair of socks. Made out report for the school month. Mr. Ross + Lillian were in. Jan. 27 Mon. Gave tests in Geom. Marked cards. Attended O. E. S. banquet at 6 o'clock + saw Wayne Chap demonstrate the work later. Didn't stay for all. Jan. 28 Tues. Final Exam in Alg. IV. Decided to pass everybody. Teacher's meeting after school to discuss next Semes schedule. Called on Miss Walz. Huron Hotel: Huron Motor Inn Menu from the "Indian Room"
In 1962, Ypsilanti lawyer Bill Anhut bought the Huron Hotel in 1962, and, so far as Dusty can tell, was the person who renamed it the Huron Motor Inn. The restaurant in the hotel, in the old-time coffee shop space, was called the Indian Room. Here is its menu. Things I find interesting: one of the sandwiches consists of "imported sardines," served open faced on toast with spanish onion, tomato, and olives. Dusty D would love this sandwich, but was surprised to see it on a menu, since I don't think it would be popular today...but why not? A mystery. Note also that lemonade is offered only "in season." We can infer that the Country Time et al drink mixes that line shelves in the store simply did not exist in the early 60s. And it hearkens back to the time when we ate everything in season (or preserved or from storage) since that's the only thing that was available. To give you some idea of the prices, 25 cents in 1962 is $1.76 today. 50 cents = $3.52, $1 = $7.04, $2 = $14.09, $3 = $21.13. Nissly's, as old-timers are well-aware, was a dry goods shop (later a hat shop om the 50s) on 16 N. Washington, the current site of Biggie's restaurant. This ad is from May 19, 1949. I find "It Pays to Make Your Own Garments" notable. That used to be the norm of course, but the fact that they feel the need to remind folks of that suggests to me that making one's own garments was going out of style at this time; I could be wrong. One thing I have noticed in old dry goods ads is that there are often a plethora of names for various fabrics that are completely foreign to me. At one time, all the nuances of fabrics were lexicalized--each variation was important enough to have its own word. Now, we just buy an off-the-rack shirt or what have you, without necessarily knowing what kind of fabric it is (and there are far fewer fabrics in general today in the general pool of clothes for sale). If I were given samples of organdy, dotted swiss, taffeta, Indian head suiting, White Indian head, and faille, I truly doubt I could label them all correctly. Just the taffeta...maybe. Why is this? It's a curious hemming-down of what used to be a luxuriously wide world of fabrics. Odd. At any rate, you can see that one of the items available at Nissly's was "Holeproof Hosiery." Dusty D is not sure how one would make as evanescent a thing as hose "holeproof" but I'll take their word for it. 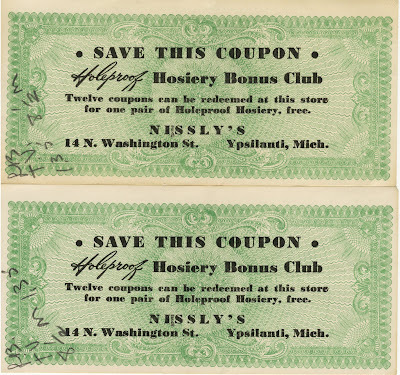 At any rate, Nissly's had a hosiery customer loyalty program. They specially printed up coupons that you could save up for free hose. They're beautiful little artifacts, nicely printed. I got to handle them today, wondering which lady of Ypsilanti's past had them in her purse, long ago, as she walked up to Nissly's front door. Last week, Allie cut up in class a bit, and had to stay after school twice due to whispering. Jan. 16 Fri. Had ever so much fun in school today. Not one of us had out French lessons and C. got mad and sent us into the room. Went up to C. N.'s last night and she was not at home. Will came up to the school after me with the horses and sleigh. Got J. and C. and then took J. S. home. Had ever so much fun and a good long ride. Went to hear Griffith read. It was nice. Jan. 17 Sat. Went up to the Gallery with Mary to get her picture taken. We had to wait a long time and while we were there two fellows came up and they were real nice. When I got home I found that J. H. had been to call on me. C. N. was out riding with Marion. She came home and stayed all of the afternoon. I went home with her and went to the Playdees. They were real nice. I had a fall right in front of the Curtises and it hurt my arm. Jan. 18 Sun. Did not go to bed last night until about twelve. Had ever so much fun. Went to Church this morning with Durbin and Carrie. Stayed to Sunday school. They are trying to get up a present for Mrs. Parsons. Did not go to Church at night because it rained and I had a good book to read. When I got up this morning I put on C's dress and Durbin told me I looked like a scarecrow. Jan. 19 Mon. It rained this morning and I would not have gone to school if Carrie W. had not come for me, but I had all my lessons and fun besides, it stopped raining before I got up it was time to go home. Did not have to stay after school tonight for a wonder. Came home and copied some music. Then played and got my lessons, read and wrote in my diary. The wind is blowing hard. Jan. 20 Tue. Marion went out to Pontiac today. S. came and sat with me this noon and asked my company to the concert. He came about half past six for me and stayed until almost wight before we went up there. Joe and Will, Carrie and geo. were there and we got a seat with them. marion got a letter from Let so I opened it. We for a letter from Uncle Tom and Will got one from Alf., so we had enough to read. Jan. 21 Wed. Have had a nice time in school today. All the girls were surprised to see me last night with S. for I did not tell one of them and they say that Linny feels real bad. She had better for such a fellow as he. Went up to Carrie's with J. S. and had a nice talk together. I wish I could have stayed for they will have ever so much fun. Jan. 22 Thurs. Went to school and the very first thing had my seat changed for whispering and I was mad enough about it. S. came over and sat with me this noon. It rained so that I did not go home for dinner and at night I got just drippiing wet before I got home and I had an umbrella. J. H. and M. C. came down in the evening. 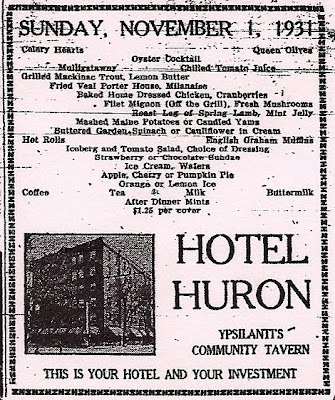 The Huron Hotel was built in 1923 with money raised from residents of Ypsilanti via the sale of $200,000 worth of stock. Here's the stock certificate you would have received had you been one of the investors. 650 people bought stock, most of them people of modest means who bought just one share for $100. 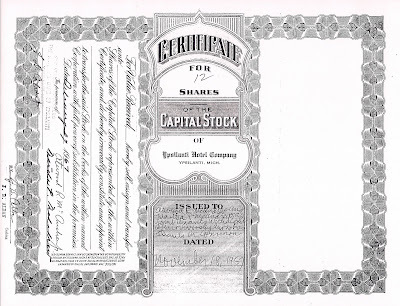 This certificate represents 12 shares of stock purchased by a couple: Atwood R. McAndrew Jr and Martha P. McAndrew. Atwood was the son of Atwood McAndrew Sr., who with Thomas McAndrew ran the Mack and Mack furniture store on Michigan Avenue. It appears that this block of 12 shares was purchased on November 18, 1957 and sold on February 7, 1967. This surprised Dusty D because as far as she knew the only sale of stock occurred in 1923, but apparently sales of stock continued after the initial fundraising. 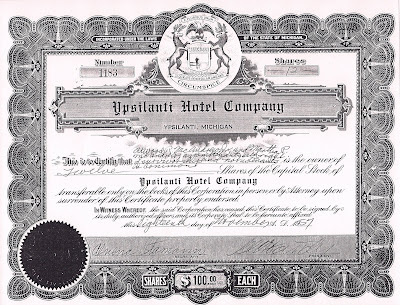 At any rate, the document is a testament to the civic spirit and pride that allowed one small city to build a hotel using only money raised from its own residents. 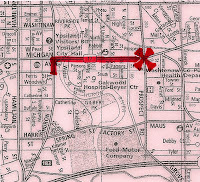 Like to take a walk with me down Pearl Street in 1924 to see what's there? Then take a peek at today's story in the Courier (thanks, A.!). What did an overworked Ypsilanti minister unexpectedly invent in 1874? You can find out over yonder at YpsiNews.com by reading my newest story, "Reverend Tindall's Tellurian." I like this one, and I hope you do as well. As some of my FB pals know, yesterday my account was hijacked by some loser who inappropriately IM'd some of my contacts to tell them I was "stuck in london" and "had a gun pointing at me" and needed money. This was a fraudulent attempt by someone to obtain money. I resent that they bothered my friends. It was really embarrassing. This morning, I found that my account was shut down. stories, and FB is a place where potential employers can see my work. user. Would you please reinstate the account? Thank you for your consideration of my question. Would you please send a quick email to disabled@facebook.com, appeals@facebook.com, appeals+0xxid2p@support.facebook.com to tell 'em I'm legit and benign? 1. Put my email username, Ypsidixit, in the subject line, e.g. "Please Reinstate Ypsidixit's Account." If you do this, please bcc me if you wish, because I will owe you a favor and I want to keep that in mind. I am sorry to have to pester you with this stupid problem--believe me, I really don't have time to deal with this mess either!--but any kind help you can provide would be gratefully received. Thank you. 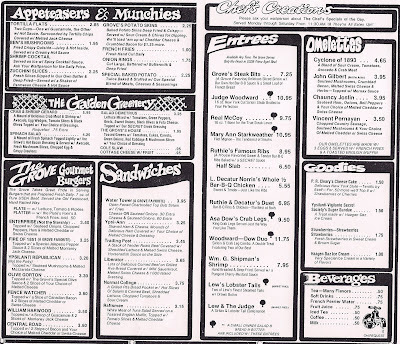 --Dusty D.
Here's a piece of Huron Hotel history; a menu from its 1980-1989 restaurant, Woodruff's Grove. The cute bit of this restaurant is that the menu choices are themed, with names reflecting tidbits from Ypsilanti history. Dusty Diary's favorite is "Asa Dow's Crab Legs." I can just imagine him saying, "I BEG your pardon!" There's also the Judge Woodward (steak, but should be something more Detroit-y), the "Raftsmen," featuring a water creature on a li'l English muffin raft, and the Salad Demetrius, which is appropriately Greek. Were Dusty D to have lunch there today, she would choose...hmm, the "Fire of 1851," yummy. The "Fence Watcher" burger confused Dusty D till she read on the back of the menu, in a little glossary there: "Fence Watcher: (mid 1850s)--A one man job riding property lines making sure fences were in good repair; prevented livestock from wandering and becoming the center of ownership disputes." Ah. Last week I posted an old photo of a long-gone building, confident that no one would guess something that doesn't even exist any more. I even started humming a carefree little tune--for about 45 seconds. That's how much time it took for BF to, once again, nail it, followed closely by cmadler, lhillebr, and, over on Facebook, Brent J. 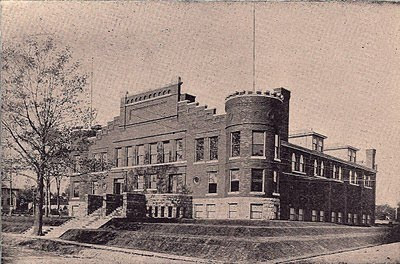 Yes, yes, you were all right--this is EMU's old gymnasium, which sat in the little parking lot just east of the water tower. However, yesterday at the Archives I had the chance to do some deep digging in some mighty obscure files. 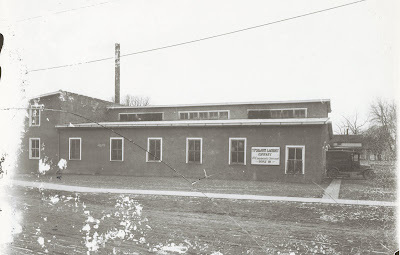 I found this photo of a vanished Ypsilanti business--its old building, however, still stands. But where? There are several clues in the photo, two in particular. Take your best guess! During the Depression, the Huron Hotel (here called Hotel Huron; both names were used through the years) was one of the few hotels in Michigan to stay open and successful. Here is what you could choose for dinner in November of '31. Things that I find interesting: There are zero ethnic-influenced dishes on the menu, though they're standard fare today. Buttermilk is one of the beverage choices. Oysters were still a common appetizer--oysters had been popular in Ypsilanti since the 19th century (one aspect of the past Dusty D is sorry she missed). Leg of lamb is still a popular and apparently common meat. All in all, it sounds delicious. I'll take the Mackinac trout if you please. 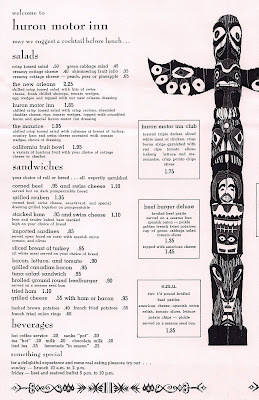 This is neato mosquito, a menu cover from the Hotel Huron in 1961 (click any image for larger version). In that year, the hotel was facing financial difficulties. The hotel started offering dinners for lunch prices and allowing weekly room rentals. 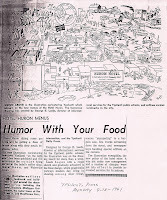 Though those efforts were ultimately not successful, one of the artifacts it generated was this menu cover cartoon featuring a caricature of downtown Ypsilanti. Here you can see the downtown hotel at Washington and Pearl. You can see the buildings on the north side of Pearl between Washington and Huron. There's the Grand Army of the Republic Hall, which of course is still standing. One Yank and one Reb are having a shootout in front. Next door, at the Huron corner, is the onetime Ypsilanti Press building. You can also see the north side of Michigan Avenue. There are a number of women swarming one store offering a sale where the modern-day Mix is housed. Note that by the 60s, the original 3rd floor of Hewitt Hall was already removed (some decades before). 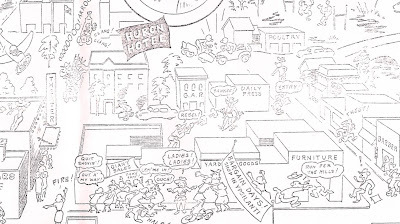 In the cartoon's upper left corner, you can see the water tower and the onetime location of the business school. There's a hunter up there too shooting a pheasant, and there's the old YHS (now Cross Street Village. In the lower left corner, you can see a box extolling the features of the hotel. Dusty D likes "TV and Radios" especially. And a fire-resistant building is always a plus. I wonder if they meant they'd installed asbestos. Note the little cartoon of a va-va-voom type girl inciting a car crash and another guy's wolf whistle. You can also see a bunch of kids playing stickball (?) and a woman sensibly hanging out her laundry. Last, here's a shot of Depot Town. You can see the Streicher murder house at Cross and Huron with the old poultry barn behind it, which did exist there for many years. A couple of guys are playing football on Frog Island--for years the YHS used Frog Island as their athletic field. Two silos seem to refer to the old Farm Bureau corn silo at Forest and the RR tracks (?). There's a simplified referenced to the old Peninsular Paper factory. Dusty D has no idea what the "Archery" building next to Michigan ladder might be. Last, you can see the present-day automotive museum ("Used Cars"). I leave y'all with a question: is that really a coal-powered steam train that's going through Depot Town? Were any of those still around in 1961? I thought things had largely switched over to diesel engines by around that time. Anything else that you notice or would like to comment on? Dusty D picked up a lot of interesting ephemera during research for my last Ann Arbor Chronicle article about the Huron Hotel (Centennial Center). I'll be posting some of these cool items over the next few days as time permits. 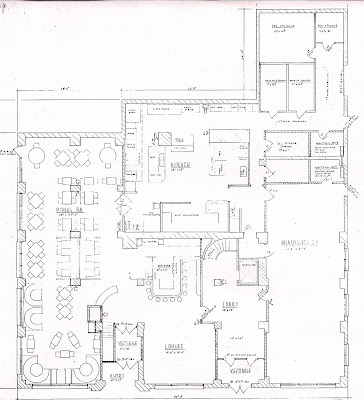 Here is a floor plan on the first floor of the hotel, labeled with a date that appears to be 1936 (possibly 1986, hard to tell; the lettering font suggests the former, does it not?). It's not much different from the original floor plan of 1923. On the left is the old coffeeshop that later served as a series of restaurants, most recently Buffalo Wild Wings and is now Korey's Krispy Krunchy Chicken. Those tables look a bit jammed-in, don't they? At top is the big kitchen., and below it, a bar occupying the original site of the reception desk. I believe the big empty room on the right was used as a formal dining room for banquets, &c. I wish I could go back in time and traipse through and see it for myself. Click to read more about: huron hotel , pearl st. , washington st.
Click to read more about: 1920-1930 , henry platt , huron st. , prospect st.
Jan. 14 Tues. Senior girls decide to wear knots of class colors tomorrow--showing their loyalty to the debaters. Jan. 15 Wed. _Debate_. Seniors _won_. Private vs. Gov't ownership of railroads. A good, strong debate. Miss Bacher's birthday. Jan. 16 Thurs. Junior colors removed from flagpole by Seniors. Whole school seems restless. Onions for supper. Am tired to night. Rec'd $40 check. Jan. 17 Fri. Parent-Teachers' Club met. Did not leave HS build'g until 6 o'clock. Lunch at school. Still trouble over class colors. Jan. 18 Sat. Washed + washed windows. Am going down town and over to Ann Arbor. Pretty tired again. Miss Laird came over. Ouija board 1st time. Jan. 19 Sun. Did not go to church. Read and slept. Oh!--it seems good not to go out unless you want to. Roosevelt Memorial service in Pease Aud. 7:30. I went. Jan. 20 Mon. Two boys told wrong stories about absences. Life is indeed strange when we can not trust each other, but, Don't become "cynical," Carrie. 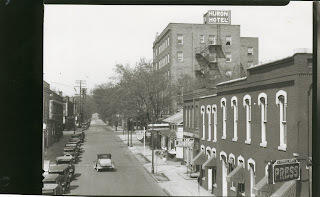 Click to read more about: 1920-1930 , huron hotel , pearl st.
Last week, holidays over, Allie started the new semester in school on a high note. Jan. 8 Thurs. This has been one of the gayest days this term and I have had all my lessons. I have had my Geometry three times and I am afraid it will be three and then out. Will came up to school after me with the sleigh. I took Joe and then took Jen home, after that we had a long ride. When I came back I found Aunt L., Clara B., and Joe W. Had a good visit and they all went off and left me alone. Jan. 9 Fri. Went to Lyceum. Had a splendid time as usual. Promenaded with J. S., J. N., Mr. H. J. S. and ever so many others. Will was here to go home. Home with Carrie and J. We got a seat over by the boys and are going to keep it every night. There were ever so many visitors. I had as many as half a dozen compliments. Nettie R. came tonight and we had other company. Jan. 10 Sat. Went up to the Library and got two splendid books. Went up to Carrie N. Had a good long chat with her. I like Durbin better than I did. Carrie came down town with me. Saw J. C. He is handsomer than ever. Went over to Mary W. after I came home and spent the evening. Made one of those horrid mistakes again tonight before Durbin (Playing). Jan. 11 Sun. Went to Sunday School, up to Temperance S. S. There was a splendid young man there--so was J. C. there. Went to Church in the evening. They had a prayer meeting most of the time and I had all I could do to keep from laughing at their Amens. N. R. is here yet. Stay up real late to read in my book. Have not looked in a book for to study my lesson. Jan. 12 Mon. Went to school this morning. Was there by Joe's when Mr. Whitman came along. He waited for me and walked up to school with me and told me which side of the question in Lyceum to take. He is just gay and I am the only girl that he has walked up to school with and every time but one he has waited for me. Had to stay after school until five o'clock for whispering. Jan. 13 Tue. Had a good talk with A. L. at the gate this noon. Ma and Pa have gone to Dexter this morning and will not be back until tomorrow night. Mr. S. came over and sat with me this noon. Would have had to stay tonight, if I had not got out of it. Came home and wrote my composition. N. R. has gone home. It is snowing hard. Jan. 14 Wed. Ma came home tonight. It is splendid sleighing. Will took me up to school this morning and this noon. Met Joe and Carrie and took a long ride. Went past all of the Normal scholars and was stared at more than a little. Got back to school just as the triangle rang. Strickland was sitting with Jennie and tried to take my hand and get it warm. He had to stay after school. Jan. 15 Thurs. Had to read my composition this morning. It is fearfully cold. Had all of my lessons today, but had to stay after school for whispering. Miss Pierce told me not to look on J. S. book and I said real loud that I could not study very well without a book. She said some did. I said I was not one of those in such a snappish tone that she and the whole school fairly roared. 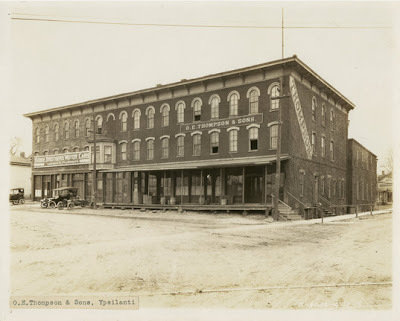 Do you have memories of Ypsilanti's Huron Hotel at Pearl and Washington (now Centennial Center)? I want to talk to you! For just 10 mins or so, for possible quotation in an upcoming article. Tiny or seemingly insignificant memories welcome [and are often the best ones!] :) Please email me at ypsidixit at gmail, (or email a phone # and a good time for me to call) and thank you! 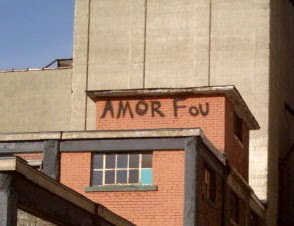 Last Wednesday's "Insane Love" Mystery Spot was no sooner posted than guessed. I never learn. As Thomas and BF correctly guessed, and despite my severe cropping, yep, it's the old Ypsilanti Farm Bureau grain silo on the north side of Forest Avenue near the railroad bridge, most recently occupied by the Frog Island microbrewery. I see that if I am to have any chance at all at stymieing you-all, I'll have to delve into my "Photos of the Lost" collection. All right then. Here's an old crenellated-tower beauty of a--whoops, almost said it. Where and what was this? This is pretty obscure, so I'll be impressed if anyone guesses this correctly. Good luck; answer next Wednesday! 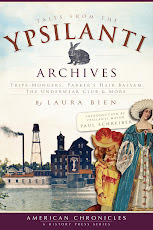 Today's article in the Citizen deals with a little-known tidbit of Ypsi railroad history; hope you enjoy it! Right here. May I Suggest Blended Squirrel?